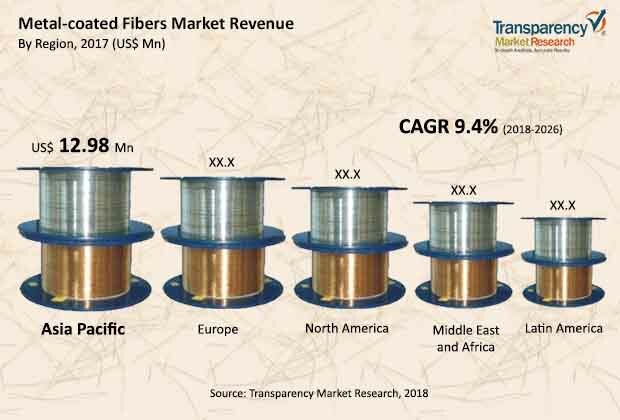 The global metal-coated fibers market is anticipated in a report by Transparency Market Research (TMR) to find a handful of players commercializing their products. As observed in most scenarios, manufacturers of meta-coated fibers use their own technologies in the manufacturing process. With a view to gain a competitive edge in the global metal-coated fibers market, players could focus on strengthening current relationships with customers and building a good rapport with new ones. They are also expected to hone their proprietary expertise and take advantage of their patented technology to score impressively in the global metal-coated fibers market. High investment in the development of new products could be another scenario observed in the global metal-coated fibers market. TMR envisages the global metal-coated fibers market to register an over 9.0% CAGR during the forecast period 2018-2026. By the end of the forecast period, the global metal-coated fibers market could attain a valuation of US$79.0 mn. Among different materials used to manufacture metal-coated fibers, copper and nickel are foreseen to account for a substantial share of the global market. In 2017, both the segments collected an over 55.0% share of the global metal-coated fibers market. From a geographical perspective, the global metal-coated fibers market is expected to find Asia Pacific securing a massive share in the near future. In 2017, the region bagged a 60.0% aggregate share of the global metal-coated fibers market along with Europe. The global metal-coated fibers market is projected to gather pace in its growth due to increasing application in cryogenic temperature and high-temperature sensors. Increasing research and development could also set the tone for valuable growth of the global metal-coated fibers market. The demand for metal-coated fibers is predicted to surge because of the rising awareness about their superior attributes such as high mechanical strength and corrosion resistance. Use of advanced composites in the aerospace and defense industry could lay a solid foundation for the growth of the global metal-coated fibers market. On the other hand, wide expansion in the oil and gas industry is foretold to augment the demand in the global metal-coated fibers market. The global metal-coated fibers market could have a positive growth outlook; however, there are some factors that may be working against it in the foreseeable future. For instance, concerns over technical abnormalities associated with the micro-bending and coating of long fibers are prognosticated to hinder the rise in the demand for metal-coated fibers. However, increased application of distributed temperature sensors in downhole oil well monitoring is prophesied to stoke the demand for metal-coated fibers. Furthermore, the growing requirement of high-tech sensing devices in the medical industry could create lucrative opportunities in the global metal-coated fibers market.